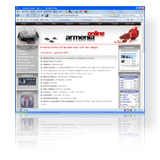 Taxation in Armenia - Property tax .:.::. The value of a building is considered as the taxable base. The engine power (horsepower or kilowatt-power) is considered as the taxable base of means of transport. 500 AMD/horsepower, if taxable base is more than 250 horsepower. 200 AMD/horsepower, if taxable base is 200 or more horsepower. 100% of property tax is applied to motor vehicles, manufactured within the last 3 years. For each additional year the property tax is reduced by 10%, but the total reduction cannot exceed 50% of the tax amount defined above. Legal persons shall submit quarterly property tax calculations to the Tax Inspectorate by the 25th of the month directly following the reporting quarter, and annual calculations � by February 25th of the year directly following the reporting year. Legal persons must pay the property tax within 5 days following the deadlines for submission of quarterly and annual reports. Individuals shall submit property tax calculations before October 1st and pay before December 1st of the reporting year.